New technologies are redefining the way actors of the financial markets ecosystem are accessing and analysing information. This growing trend, added to the international profile of investors, requires that listed companies establish a real digital strategy for Investor Relations. Webcasting, in this regard, provides clear benefits to listed companies. 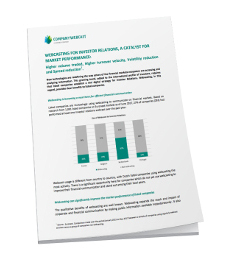 The Euronext Corporate Services team, jointly with Company Webcast, has run a comprehensive analysis of listed companies on Euronext markets which use webcasting and compared their market performance versus a group of peer companies which do not use webcasting. In this research whitepaper you will find out the significant impact webcasting can have on your market performance. Download this whitepaper for free by filling out the form on the right form.